I wanted to highlight this Nashville event, which coincides with a BIG rally in New York on Sunday. Things are about to get really bad in Darfur, and unless people get together to raise awareness, thousands will die. Get involved and act. Tennesseans Against Genocide, in association with Vanderbilt STAND and Belmont Coalition Against Genocide, is presenting Darfur Diaries, a powerful hour-long documentary this Sunday at the Belcourt. Sunday, September 17 is Global Day for Darfur, a day of rallies around the country and world, including a major rally in New York City to coincide with the convening of the 61st General Assembly of the United Nations, to urge immediate international action for Darfur. We will also have Klint Alexander, a lawyer specializing in international law, who will speak briefly on what is preventing international action at this time and why action is justified. There will be an opportunity for questions. Money will be collected for two humanitarian organizations with food programs in Darfur: Mazon and the World Food Program. The humanitarian situation in Darfur is worse than ever. According to the American Jewish World Service, since June the number of Darfurians without access to food aid has doubled. Due to lack of funding, the World Food Program warns of further cuts in food aid by October, which could affect three million civilians. With the NFL season opening tonight in Pittsburgh, the 2006 Titans season is just a few short days away from kicking off at LP Field. In The Tennessean’s Titans Preview section released today, David Climer writes that everyone should long for the 8-8 days. If you don’t remember, he’s referring to the 1996-1998 seasons when the Tennessee Oilers put up back to back to back .500 seasons. Climer makes the point that this Titans team is closer to 3-13 than 13-3. I regrettably have to agree. Call me a fanboy or a homer, but part of me wants to believe this team can overachieve and some how scratch out a 9-7 or even a 10-6 season. Then I reflect back on the unproductive preseason, the indecision at the quarterback position, and the helter-skelter personality of this team and I just don’t know if it’s possible. Come Sunday, we will get a glimpse of where we truly are headed. Dell is offering consumers in Metro Nashville and the surrounding counties a one-day, free computer recycling event on Saturday, September 9, 2006 from 9 a.m. to 3 p.m. at Vanderbilt University parking lot 74, located on Natchez Trace, north of Blakemore Avenue and across from the Vanderbilt track. Any brand of computer (CPU), monitor, printer, or other peripherals (mouse, keyboard, scanner, etc.) will be accepted. No other electronic equipment, such as telephones, televisions, stereos and appliances, will be accepted. Please remove all data from your computer’s hard drive. Local partners for the community event include Vanderbilt University, Vanderbilt Environmental Health and Safety, Vanderbilt Center for Environmental Management Studies, Metro Nashville Department of Public Works, Metro Beautification and Environment Commission, Tennessee Environmental Council, and the Tennessee Department of Environment and Conservation. Dell is committed to responsible solutions for reusing and recycling unwanted computers. Recycling computers instead of disposing of them reduces the amount of waste that gets placed in our landfills. Take this chance to clean out your attics, closets and garages and recycle your unwanted computers for free! When possible, dropped-off equipment will be refurbished and reused, but cannot be considered a donation through this event. If residents are interested in donating working equipment to a local non-profit organization, please visit www.dell.com/recycling to find out how the National Cristina Foundation can give your unwanted computer a second life. Donated equipment must meet the minimum donation requirements outlined on Dell?s website. If you cannot attend the event on September 9, Dell will pick up your old computer at home and recycle it. Find out how at www.dell.com/recycling. For more information, please contact Johnny Vanderpool with VEHS at johnny.vanderpool@vanderbilt.edu. To volunteer to help with the event, please contact Atulya Tankha with VCEMS at atulya.tankha@owen.vanderbilt.edu. Want to check out Nashville’s lovely riverfront park? Too bad. 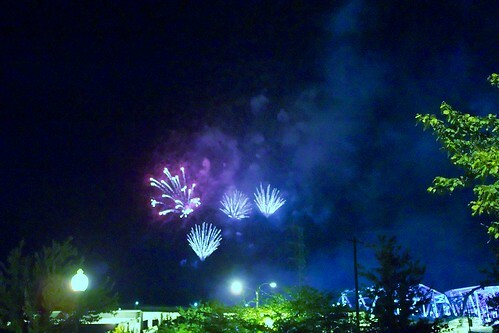 Am I right to be concerned with the frequency of this sight at riverfront? 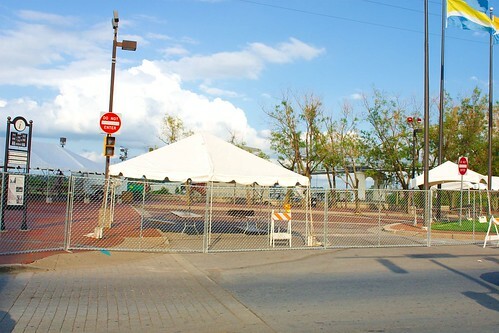 Riverfront park, ostensibly a “public space” — a park funded with public tax money — being fenced and barricaded off from the public for use for private events that charge for admission. I mean, it was one thing to have the sidewalks blocked off by portapotties when it was for a free festival — like in the heyday of Dancin’ in the District when it was still free. But now, I don’t know. It’s not so cute anymore. When did Nashville’s nicest downtown park turn into a private music venue?